This past week has sure flown by! School has started to pick up and the Redford has a great movie showing every weekend, now that it's fall. They are starting their Halloween horror fest this coming Saturday...I can't wait. All double features and this weekend it's The Blob and another film. Anyways, this past weekend my mom and I headed to Midland, MI for their annual flea market and antique show. I have to say that I was a bit disappointed this year. last year the show was packed and every vendor had a great deal on something. I did mange to find some things that have been on my "want list." First find of the day was the vaseline reamer, something I have been searching for forever. This one was only $4 without any flaws. Definitely my deal of the day. Also in the picture is a vintage glove box. I have been wanted one of these for a while too, and just couldn't seem to find one. This bright pink one was only $6 and in near perfect condition. There were a few vendors with clothes, well really three to be exact. I found this blouse ($3) from one. 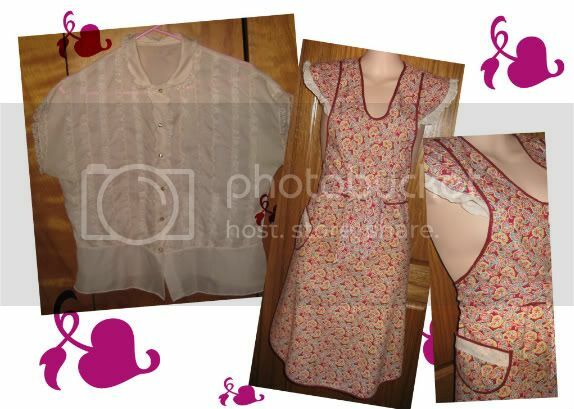 It has some pretty bad underarm stains, but it is great condition otherwise and has those great rhinestone buttons. This will get dyed a slightly darker pink, just to cast out the stains. The apron was purchased from one of the other clothing vendors. It is made from the most lovely feedsack and in such a cute design. So for $4.50 I added another vintage apron to my growing collection. These last two items were the big ticket purchases of the day. Above is a REAL leopard fur collar. I have been searching for some kind of leopard coat or scarf to go with this awesome 40's leopard hat I won off eBay. I am probably going to put it on a brown sweater, but I am still not sure yet. I was so happy to find this and to be able to check one more item off my list! Now, my favorite find of the day. I am addicted to vintage fine jewelry and diamonds. Since both are usually so expensive, I only have a small collection, mostly full of family pieces. There was one vendor there that had all this exquisite estate jewelry and it was so hard to not look! There were so many pieces that I would have loved to take home with me, but I settled on this necklace. I have been wanting some sort of an older piece of vintage jewelry, pre 1900's. I had also been admiring some diamond solitaire pendants when I was shopping the other day, so I got both in this piece! The lady said that it was Victoria era (around the 1880's-1890's) and it is two-toned. 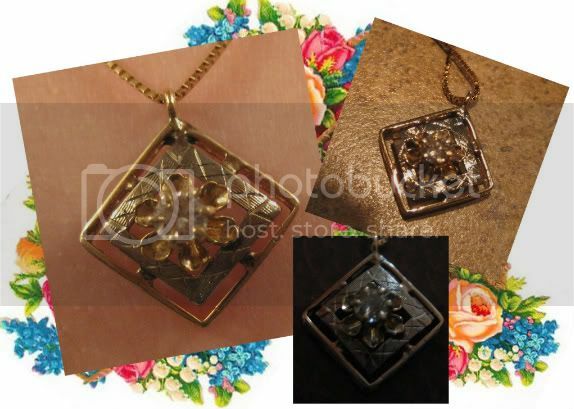 It was really hard to photograph, so I have a couple of different views in the collage. The mine cut diamond really sparkles!!! So even though the show wasn't as spectacular as last year, I still had a blast with my mom and did come home with a few nice goodies that I really do love! I'd say you got some pretty nice items at the market! 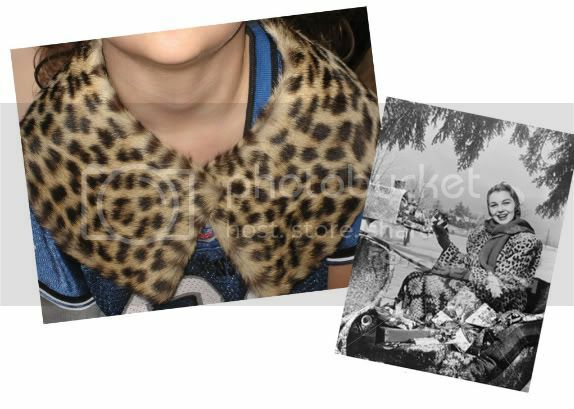 The leopard collar is gorgeous! Good luck this semester at school. The necklace is so YOU!!! and how fun to finally find fur collar. Love the red dress that you mended. It Looks wonderful on you. I am really enjoying your blog. 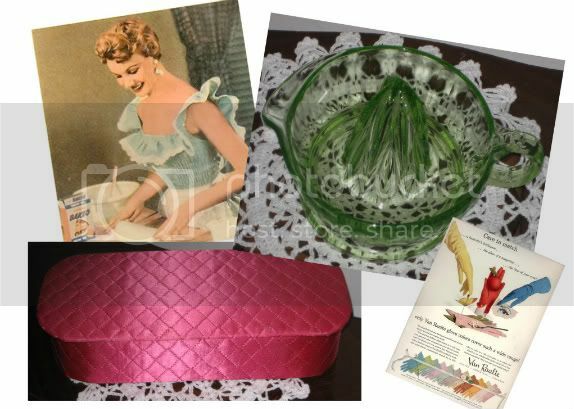 I LOVE vintage and am much of a 1950's girl at heart. Love your site!! The Redford and "Dial M for Murder"